A record 31-car grid is set to blast off at Brands Hatch next weekend (29/30 March) for the opening three rounds of the 2014 Dunlop MSA British Touring Car Championship. One of the most eagerly anticipated seasons in the championship’s illustrious history boasts a line-up that includes seven champions, a further half dozen BTCC race winners and a significant batch of rising contenders. The appeal of Britain’s premier motor sport series is not just about driver talent, however, as 14 different flame-spitting models of car – based on popular road going family models – represented by 11 of the world’s largest car manufacturers will take to the track throughout the 2014 season. What’s more, the battle will be played out in front of hundreds of thousands of trackside spectators over the course of the campaign and millions more who will watch every race live on free-to-air television. As in recent years, the Brands Hatch circuit in Kent will bookend the season with the final event of 2014 taking place on the legendary Grand Prix layout in October, but first up is the challenging 1.2-mile Indy configuration. Circuit owner MotorSport Vision is expecting one of the biggest crowds for a season-opener in recent history, with fans making their way from London, the South East and further afield. The BTCC line-up features an unprecedented seven champions in its ranks, headed by reigning supremo Andrew Jordan who took his maiden title during an unforgettable 2013 season. Jordan fended off four former champions in the last race of the year, also at Brands Hatch, and the 24-year-old will be looking to get his title defence off to the best possible start in the Pirtek Racing Honda Civic next weekend. 2012 champ Gordon Shedden fell short of retaining the crown by just seven points last season after a stellar last gasp effort at the Kent venue. The Scotsman and his three-time champion team-mate Matt Neal both remain with Honda Yuasa Racing for 2014, but the duo will be piloting the all-new Civic Tourer model. Jason Plato has won more BTCC races than any other driver in history and produced a sensational performance last time out at Brands Hatch. The MG driver won two of the final three races of 2013 and came close to scooping his own hat-trick of titles, which will now be his aim for the year ahead. Colin Turkington returned to the BTCC in 2013 after a three-year hiatus and produced a stunning effort. The Ulsterman remained in title contention until the final day of the campaign, despite his BMW 125i M Sport only breaking cover on the eve of the season. His eBay Motors squad has a year with the car under its belt and a strong pre-season behind it, so Turkington is confident of contending again. The biggest announcements in the off-season proved to be the return of two double-champions in Alain Menu and Fabrizio Giovanardi. Menu, a legend of the much loved Super Touring-era will be driving a VW Passat run by Team BMR this time around, whilst Giovanardi will spearhead the challenge from local team Airwaves Racing. Local heroes: Season to start with a home win? Wrotham-based team Motorbase Performance has an international touring car star in its ranks this season, plus a BTCC race winner and a local rookie who will make his tin-top debut next weekend. Italian Fabrizio Giovanardi is hoping to bring the squad its first drivers’ title and he’ll be joined by Mat Jackson in Motorbase’s Airwaves Racing line-up. 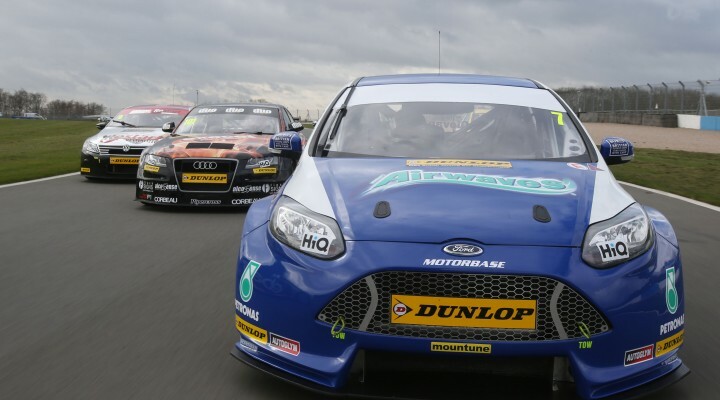 The team will also run a new entry for Crabbie’s Racing which has Surrey-driver Jack Clarke piloting its Ford Focus. Clarke has won at Brands Hatch during his single-seater career but this event will represent his BTCC baptism in front of a huge home crowd. West Surrey Racing will bring its trio of eBay Motors’ BMWs to Brands Hatch next weekend, looking every bit championship contenders. Multiple race winner Rob Collard and podium visitor Nick Foster have both made huge strides during winter testing, but the team’s biggest hope lies arguably with the aforementioned 2009 champion Colin Turkington. Thurrock’s AmDTuning.com will add a fourth Ford Focus to the grid with its new signing Dave Newsham looking to repeat his race winning form of 2012. One man who is no stranger to winning is BTCC debutant Marc Hynes, who brings with him a fascinating story. Back in 1999, London-based Hynes became the British F3 champion – a series famed for promoting drivers directly to Formula 1 – when among others he saw off the challenge from a certain Jenson Button. The rest, as they say, is history as Button went on to grab F1 glory while Hynes failed to get the breaks he deserved to reach the highest level of single-seater racing. After a lengthy sabbatical, however, Hynes has chosen the BTCC to make his long-awaited comeback and he’ll pilot a highly competitive MG6 run by multiple champions Triple Eight Race Engineering. “I’m loving it so far – the cars are great to drive and I can’t wait for the racing to start,” said Hynes after completing his pre-season testing programme. “The championship provides great racing in front of lots of spectators, who always create a fantastic atmosphere. Three BTCC races will take place on Sunday, with the entire race day being broadcast live and in high definition on ITV4 from 10:30am. In addition to the BTCC, there’ll be a plethora of races on the support bill. The Dunlop MSA Formula Ford Championship of Great Britain – the series that launched the careers of a host of top drivers including Ayrton Senna and Jenson Button – represents single-seater racing. Sportscar racing fans will get their fix with races from the Michelin Ginetta GT4 Supercup, Porsche Carrera Cup GB and Ginetta Junior Championship, whilst the Renault UK Clio Cup – often seen as a stepping-stone to reaching the BTCC – will also feature on the huge bill of British racing. Tickets for the Dunlop MSA British Touring Car Championship season-opener at Brands Hatch on 29/30 March are available from £26, with free entry for children aged 12 and under. For more information call 0843 453 9000 or visit www.brandshatch.co.uk. All admission includes access to Sunday’s lunchtime autograph session with the BTCC drivers in the pit lane as well as free parking. Click here for a full event timetable.